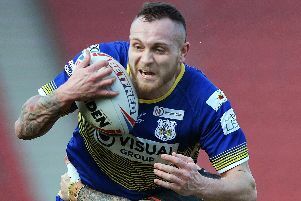 Doncaster RLFC regained their Betfred League One promotion play-off spot at the weekend and are determined to hang on to it this time. The early-season leaders, who dropped down to ninth at one stage during a run of five successive defeats, currently stand fifth and entertain hopes of finishing third which would secure them a home draw in the play-off semi-finals. “I think the fans were panicking more than us at that stage,” said assistant coach Pete Green. “We knew that there was a long way to go and that once we had sorted out one or two things that we’d finish strongly. “It’s nice to be back in the five but where we are at the moment means nothing and a lot of things can happen between now and the end of the season. Reflecting on the club’s 46-4 win at Coventry on Sunday, Green said: “That’s four wins on the trot now and we’ll be looking to keep that run going when we entertain London at the weekend. “We could have scored more points had we been a bit more clinical at times but we’d have settled for the final scoreline before the start. “We were very direct in the first half and led 30-0 at the break but it looked as though we had put the cue back in the rack at times in the second half. Centre Connor Bower also caught Green’s eye as did stand-off Jordan Howden. “A lot of people played well but for me the stand-out performers were second-rowers Brad England and Frankie Mariano,” he said.